The Bobcat Chronicle: Name that Lane Celebration! Saturday night November 19th our 'Name that Lane' Initiative came to a close with a HUGE celebration (click here to see the slideshow). Adding to the cause for celebration was an afternoon that included victories for both our men and women against Wesleyan in our first dual meet of the season (men for the first time in a decade!). 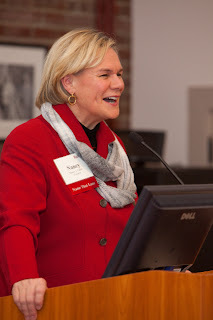 Over 80 alum, friends, parents, and current team members gave to this initiative - and nearly 80 showed up for a dedication ceremony and fabulous dinner. Our new blocks are the latest technological advancement in the sport with the rear back plate for more power, and the side handles for better reaction times. They are absolutely top of the line and beautiful to look at - especially next to our new lanelines and flags! Below are some pictures and the dedication script for each block. Enjoy! 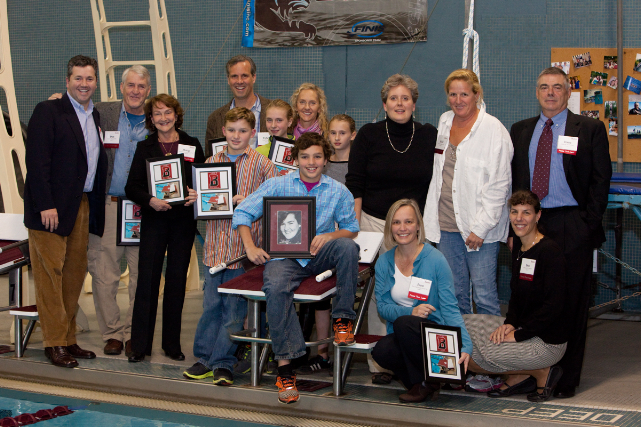 And thank you to all that were honored for inspiring us... and to all that donated for making this a reality. Since I arrived on campus few things have remained constant, but seeing Gail Dow walk in three times a week with a smile is one of them. Gail has been a beacon of light each day, and she will tell you over and over again just how happy she is to come to Bates and swim in such a magnificent facility. Gail has been good to the swim team and our lifeguards for as long as I can remember with donations to the program, treats for the lifeguards every holiday, and our favorite – a Lifeguard Dinner at Longhorn Steakhouse each Spring. Truth be told, she initiated this entire event. As I recall, about nine months ago I joked with Gail about the special treatment we give Lane 1, as it is her lane... and then half jokingly I mentioned it could officially be hers with a rather large donation to the program! The next day she showed up with a check. I stood there smiling while the wheels in my head started spinning feverishly. Well, nine months later Gail M. Dow helped create one of the best fundraising events in Bates Swimming and Diving history. 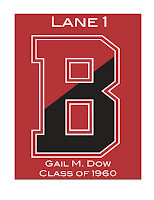 Just this afternoon as our meet started we received anonymous donation in honor of the class of 2015! What a great example of how a celebration can inspire others! When I took this job four years ago, I impressed upon the team that no one could do it alone. You needed to support your teammates at every opportunity because sooner or later you were going to need that support, too. That conversation quickly ballooned into a "team first" theme come NESCAC championships. Never has a Bates athlete done their best when they were doing it simply for themselves. If you need proof, look at our relay results, and you will immediately notice the amazing splits that comprise each time... splits which clearly outshine individual achievements performed merely hours before. At the culmination of day two of the 2011 NESCAC Championships we witnessed some especially great, and somewhat surprising, relay swims. At the team dinner that night I launched into a talk about finding inspiration in your teammates, and not being afraid to inspire others. More important than any yard practiced, or any speech given, an imagination can inspire both yourself and your teammates. Luckily for us, that talk inspired some great friends to make an inspirational donation to the swim program. When I first joined the program I was immediately introduced to John W. White, by none other than John W. White himself! In an instant I became a fan of the spark in his eye, his passion for Bates swimming, the pictures of his hybrid irises, and, of course, his love for his family. 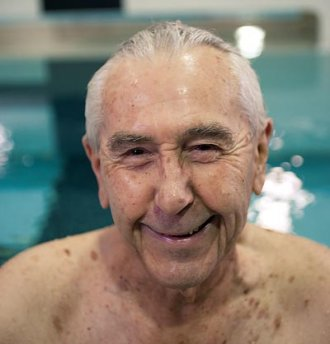 The true "father of Bates Swimming" started making his impact as a freshman in 1935 enlisting his father as the new Bates Swim Coach. He then went on to find a group of about 10 men to compete as the first varsity swim team. By the end of his career the Bates team was small but fierce - and as John would tell me, still holds the highest finish at a New England championship meet (3rd, I believe!). Along the way, he taught me about the history of Bates College, his own personal accomplishments as a Masters world record holder! -- and of course, he taught my team how to love Bates and this program. About a year and a half ago we lost John - and it was a tough day for everyone that knew him. It is a privilege to honor such a great man with this lane. In 1988 Dana Mulholland took the reigns of the swim team out of current soccer coach George Purgavie’s hands - and put a stamp on this program that continues to live strong today. 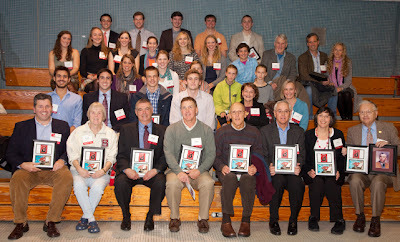 The two-time Coach of the Year lead this program into an era that includes nine Senior Citation winners, the highest team finishes ever in terms of both NESCAC and National level championships, and, of course, the dozens and dozens of athletes that comprise our record board and our top times list. All those accolades are great, but Bates and I will always be most grateful for the type of athletes he attracted and created. Not only were they talented, but they represented the type of person that every coach dreams of teaching. They trusted their coach, they cared about each other, they believed in themselves, and they worked hard for every single success experienced. If there is one thing I know about Dana’s 18 years here, it is that his swimmers found a place where they were treated right - and given the right opportunities to improve, grow, and mature. He was undeniably loved by his athletes - and when this initiative went live to the alums it took simply a few days to have a lane named after him. What can be said other than - WOW. The conversation has always been that Bates Swimming and Diving is much bigger than the four years you are on campus - and this class has exemplified an understanding of this concept in so many ways. Over the past four years we have jumped five spots from 10th to 5th with the women, and four spots from 11th to 7th with the men. I can honestly tell you, a few of them may feel they are solely responsible for this jump - and truth be told, I am here today confirming the fact that they did play a rather large role in that improvement! But more seriously, from the hours spent here at Tarbell, to passionately recruiting in athletes that many times challenged their place on the team, and, of course, to giving back financially to the program (during their senior year!) 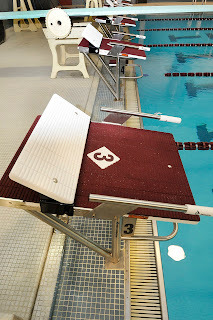 – they have done everything I have asked – and they have also lived Bates Swimming and Diving to its fullest. In my experience, rarely does an athlete, let alone an entire class, have the ability to reflect and appreciate their experience while engrossed in it. It is simply another example of how this class has surprised many over the years. Many of their names are on the record boards, and many of them have inspired their teammates to perform better... 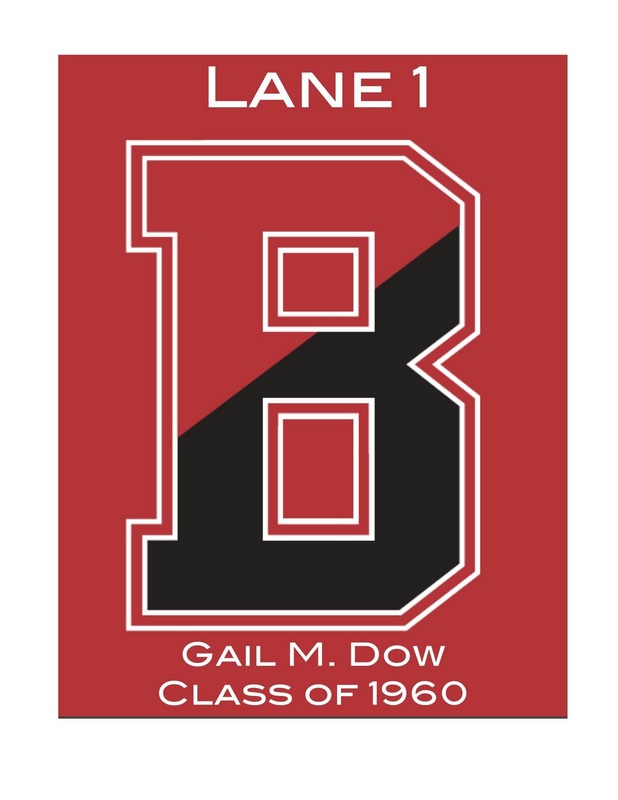 However, as records are broken, and new team memories are forged, I could not be happier to always remember the first class I recruited to Bates - and of course the personalities that existed among them - every time I look at Lane 6. 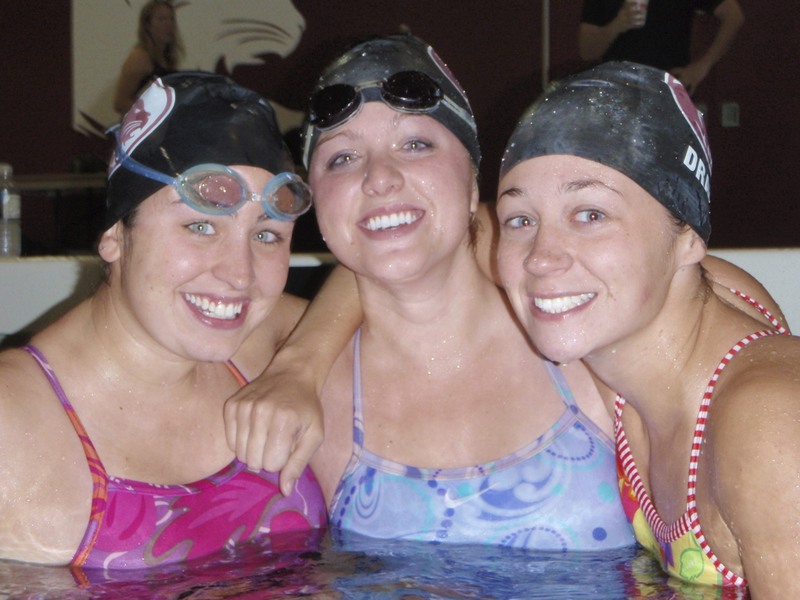 Over the summer a recent graduate and former captain, Katelyn Drake 2010, came back to Bates to work at our swim camp. She had spent a year out of college teaching and coaching, and now was about to start a new job at a successful finance company. During her four weeks off, she chose to spend three of them here with us - teaching swimming, working with kids, and giving back to the program by both helping me,  and passing along her knowledge to current team members. At one point, I realized I surely wasn’t paying her enough for this… and although I know the food is great here, I can’t imagine that was a deal maker either. I sat down with Katelyn to thank her and we ended up talking about what an honor and privilege it is to be selected by your teammates as captain. She mentioned we had an opportunity to not only tell current and future athletes this, but show them too. 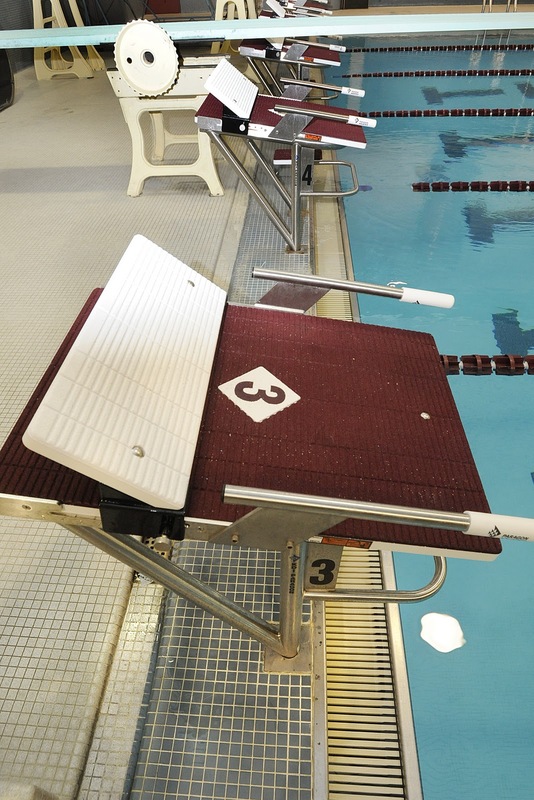 She confided in me how thankful she was for Bates swimming and felt that others would be, too. Four weeks later, over 30 captains responded to Katelyn’s email and idea - and they all came together to say thank you to Bates College and Bates Swimming with donations toward lane 7. I couldn’t be more impressed with their continued leadership toward the program. On June 15th 2011 I received an email from Chris von Jako with an idea about honoring Wendy Moore, a teammate who had passed from a skiing accident much too early in her life. On June 21st an email went out to teammates from Chris's era - and on June 24th they had exceeded their goal. That was 9 days from conception to completion! Over the past 5 months I have heard from Wendy's teammates that “she was always smiling and laughing - and it was a memorable laugh that simply won't be forgotten." 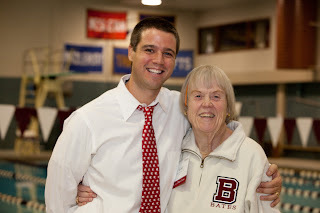 She absolutely loved Bates College, the swim team, and the arts. In fact, Wendy spent her junior year abroad as a silversmith in Nepal. After Bates she received her master’s from the Art Center College of Design in Pasadena, CA, and went on to work in the film industry and exhibit her art in New York and Los Angeles. She had an eye for beauty, a love of athletics, and zest for life - and clearly was loved and respected by her Bates Swimming family. I must be honest and admit that experiencing Chris and his teammates honor both Wendy and Bates was a moment in my career like no other. The outpouring of support for both the college and a teammate was inspiring. Nearly 20 teammates of Wendy’s eagerly grabbed an opportunity to connect back to a valuable and memorable part of their Bates experience. It showed me once again how important four years at Bates can be. You may (or may not be small anymore) but you sure are Mighty! Those blocks look fast just standing there! Special place, special program, congratulations to all for doing it right.